Eager to get on the way, we loaded the car and began our journey. The crisp Sunday morning couldn’t have been any more perfect. We were scheduled to minister in a church on the south side of Chicago that morning. So we got an early start for the trip from Milwaukee, to insure plenty of time to get there. We had already gone a good distance when all of a sudden there was a loud noise followed by a lot of shaking. We pulled over to the side of the road only to find the tire was shredded to pieces. Surprisingly, it only took a few minutes to grab the spare and get back in the car heading for Chicago. This little setback seemed only to confirm to us that God had great plans in store for the meeting ahead. Most people would agree that the Welsh Revival was a revival of prayer. Often the meetings would go for hours without any type of teaching or singing, only with prayer and travail. God used a young man named Evan Roberts as His instrument, who was a true intercessor and a man of prayer. Evan was persistent in prayer, knowing the key to revival was through a life totally surrendered to the Holy Spirit. At times it would seem his passion and persistence in prayer was unnatural. Yet, when you look at the results of one hundred thousand souls saved in six months, you can only rejoice for his obedience. God is not a respecter of persons, but is looking for anyone who will yield to a life of persistent prayer. Have you ever come to the place in your life that you feel dry and dull? Maybe you have had an onslaught of work that seems to be piling up or your visiting family has gotten you to the point of exhaustion. Whatever the case might be you have found yourself totally spent and depleted. You have poured out so much that there isn’t one more ounce you can give. The cook’s statement, “it’s well done and on the verge of being burnt” describes you and where you seem to be. I believe many find themselves in that familiar place more often than not. In times of spiritual dryness, we need to be saturated in God. If we have become dry, it’s a good indication that we haven’t been soaking in the river that flows from God’s throne. In other words, when we become dull and to the point of not being effective for the cause of Christ, we need to get in the Lord’s presence. One of the enemy’s biggest strategies is getting us so busy that we never stop to sharpen our spiritual ax. If our ax is dull then we use our own strength until we are so ineffective we burn out. 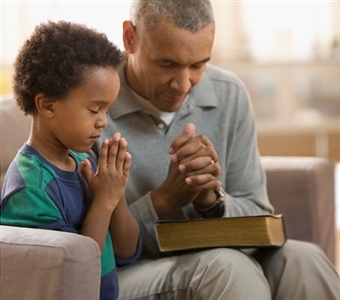 Without a discipline of prayer in our lives we will become duller with the more work we do. Even when it is good righteous work that pleases God. Prayer is one of the very things that sharpens our spiritual edge. Unfortunately, in trying times and being spiritually depleted, many people take a sabbatical, stopping the Lord’s work to gain rest and restoration. But if we look at the scripture it wasn’t until God was done with His work, creating the universe, that He stopped and rested, (Gen.2:2). When we become spiritually dull, we need to run to God in prayer and sit at His feet, soaking in the river of life not run away from Him. I do believe we can get off balance with our work unto the Lord, as we see Martha did in the Gospels. But let me also say stopping your work to do nothing is also wrong. It is essential that we spend time in His presence in prayer. If we are continuously basking in Him we will never get dull or burned out but will instead be fired up and sharp in the things of God. So let me leave you with this last statement. Don’t get so busy doing good works that you don’t have time to pray.